Remember a while ago when Bill Clinton advocated for New York City building owners to paint their roofs white to save on energy use through air conditioning? According to researchers at Concordia University, he was onto something pretty good there. According to the study, painting as little as 1% of urban surfaces around the world white, including rooftops and pavements, could reduce carbon dioxide emissions by 130 gigatons over the course of 50 to 100 years. That’s huge, considering CO2 emissions hit a record high of 31.6 billion in 2011. While it sounds like one of the simplest, cheapest, and most efficient ways to cut down emissions, why isn’t every city in the world, or at least in developed countries, getting in on this? 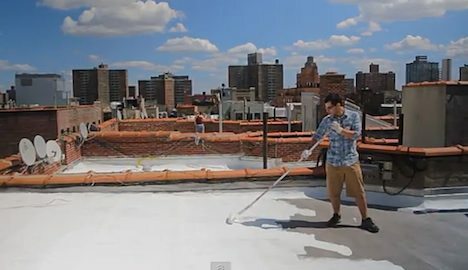 There’s even a non-profit in New York City, the White Roof Project (see video below), which gathers volunteers to provide roof painting services. We have a long way to go before we’ll actually get to that point, but at least it’s an efficient way to cut down emissions that we already have the ability and resources to do. Between white roofs and improved insulation, it’s becoming easier for families and businesses to cut energy costs where it really counts. Ever considered painting your roof white?